Cute jacket, I love it over the romper! And welcome pup! Hi dear, loving the colour splash in your outfit, the orange is such a refreshing change from the usual denim, you look fantastic! you are adorable! I would love it if Lumen makes a regular appearance...she is indeed a natural! I love that you have a color denim jacket--so cute! your romper is so cute, and I love the color combo. and that dog is one cute photogenic piece! Oh my goodness! Lumen is adorable!! I love your jacket! Love the jacket/romper combo! Lumen is adorable!!! The romper is amazing. You look very pretty! Really cute romper and I love the color of your jacket! Well arent you just the cutest thing?! 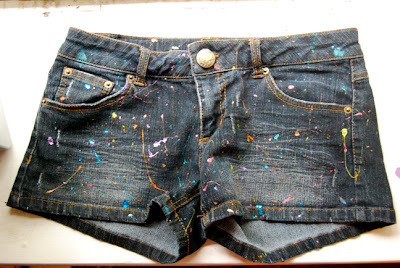 I love those colors together, and the shorts at the end with the splattered paint look...amazing! 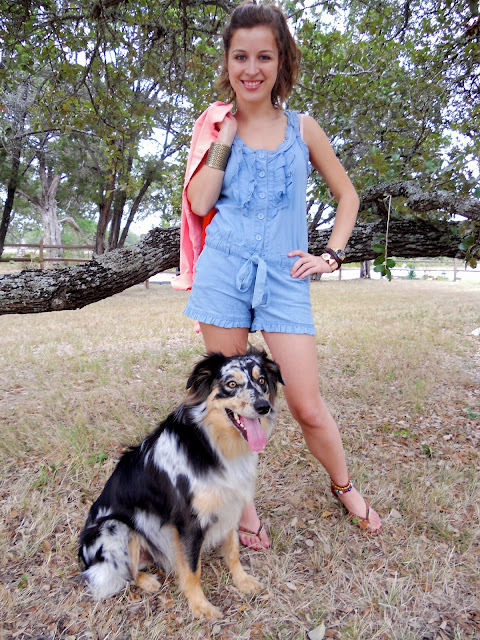 CUTE romper and OMG your brother's dog, soooooooo cute! Very very cute, especially the jacket! WOW, You look so pretty! I love your blog! You look great in that romper! I've always been a little intimidated by them, but this one is so cute! Yay! Love discovering the blog of another Texas girl :) Adorable ruffled romper! Loving the dog, and yes, you should include him in future posts! i am loving this jacket!! love the idea of colored denim! I love denim jackets and in this color...amazing! love the romper! and the splash of colour with the jacket! ah how lucky you are to be enjoying such nice weather! I would do anything for a day in the 70s! I LOVE your jacket- such a fun color and style, and I love the way you put it with that romper! love love love the happy color of your jacket... also, your hair is so cute in a high pony! love the denim jacket! Such a gorgeous color !! I love your color mix....so summery so fun!! Pink and blue is an old and darling color combo, but you really mixed it up with the textures and fabrics. wow I've never seen pastel pink and blue look so good together!!! Like the pink colour of your jacket ! the colors of your outfit are great! Wauw, what an great outfit! Temporary? That jacket is lovely. You should make it permanent. Love the jumper and that jacket is awesome! So cute, we are now following you :) Would love for you to checkout our blog when you have a minute. That jacket's too cute. Perfect for crazy weather, which we Alabamians have also been having! 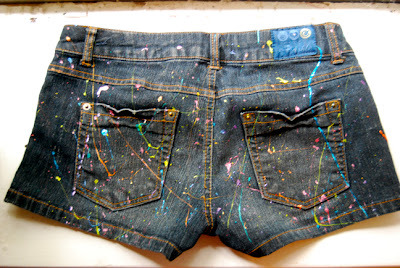 Hope to see more of the doggie and the splat jeans are awesome! Love the colour of Ur jacket! ohh lovely look dear!love your pink jacket!! Awesome jacket - love the color. And I'm obsessed with your romper! Those are definitely a summer staple for me. Lumen is gorgeous! Her coloring is so unique. Can't wait to see more of her! hi dear, thanks so much for comment on my blog! It's pink! What more could you want :D Super adorable! This denim jacket is adorable! Love the color and cut!